On the 3rd, 4th and 5th January BBC2 ran some exciting programmes about stars, constellations, planets and the other wonders of the Universe. In the programmes, hosted by Professor Brian Cox, Dara O'Briain and Jonathan Ross they helped us to navigate our way around the heavens and to experience some of January's unusual astronomical events - a partial solar eclipse, the Quadrantids Meteor Shower and Jupiter aligning with Uranus, and more! 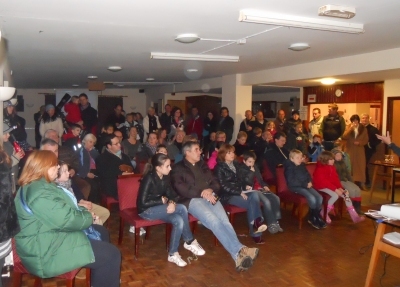 Stratford Astro followed these programmes up with a "Star Party", at Snitterfield Sports Club on Saturday January 8th. We had a great night with around 300 people attending. The photo on the right shows one of the four indoor briefing sessions that were provided in advance of observing in order to enhance everybody's experience. Thanks to everybody for coming, sorry about the long queues at the telescopes but we hope the wait was worthwhile.